1. Edit the related Control Template. 2. Find the if statement that checks if there are no results returned. 4. Change the default text and if need add a new class for styling. 1. Edit the related Item Template. 2. Add the PublishingPageContent to the ManagedPropertyMapping. For a clean example I removed all mappings besides Title and PublishingPageContent. 3. Create a variable for the PublishingPageContent column. 4. The PublishingPageContentHTML will contain the page content but with styling. The following code will remove the styling. 5. In most situations we also want to show a maximum number of characters followed bu three dots. The following code will limit the amount of characters to 175 followed by the required dots. If the content is less then 175 characters long, no dots will be displayed. 6. Us the code below to display the PublishingPageContent. 5. Us the code below to display the PublishingPageContent. 2. Add the ArticleStartDate to the ManagedPropertyMapping. For a clean example I removed all mappings besides Title and ArticleStartDate in the code below. 3. Create a variable for the ArticleStartDate column. 4. To be able to format the date we need to create a new variable of the type Date. 5. Us the code below to display the ArticleStartDate with the required format. With SharePoint 2013 the term Best Bets is no longer used, the new term is Promoted Results. The concept of the feature is the same, an administrator can serve (promoted) results based on specific search phrases enter by a user. The promoted result will appear on the top of the search results, this is a powerful way to promoted search results within SharePoint 2013. Specific results can be brought forward to the users attention with minimal effect and without changing any difficult ranking mechanic or index. 1. Open SharePoint 2013 Central Administrator. 2. Open the Managed Service Applications and click on the Search Service Application. 3. Click on Query Rules. 4. 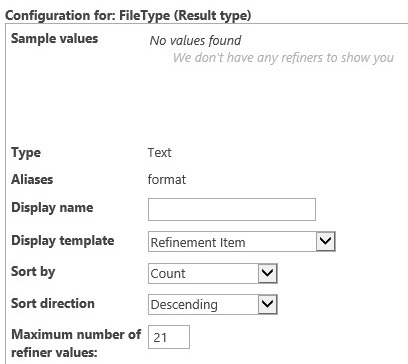 Select the context (source), in this example I used the Local SharePoint Results (System). 5. Click on New Query Rule. 6. Enter a Rule name. 7. Specify the exact phrases for the promoted result, use a ; to separate multiple phrases. 8. In this example I will make a promoted link to a image library. 9. Click on Add Promoted Result. 10. Enter the Title and the Description of the Promoted Result. 11. Specify the URL that will be linked to the promoted result. 12. Save all the changes. 13. The promoted result is created and ready for use. 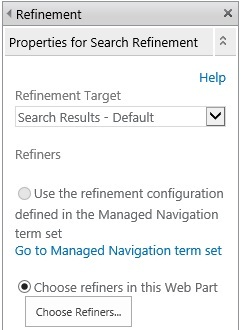 In SharePoint the refinement panel is used to narrow down the search results. 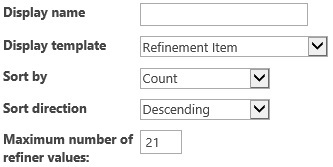 SharePoint provides a set of default refiners containing result type, author and modified date. Compared to previous version changing the refiners is simplified and very straight forward. Existing refinement options can be added through the user interface and options can be set per refinement. 1. Edit the Search results page. 2. Edit the the refinement panel. 4. With the Refinement configuration available refiners can be added or removed and ordered. 5. The following setting can be changed for every selected refiner. 6. Apply the changes and publish the search results page. 1. Open Central administration and open the Manage service applications. 2. 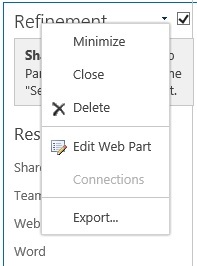 Select the Search Service Application and click on Manage in the ribbon. 5. If the column is not available preform and crawl. 6. 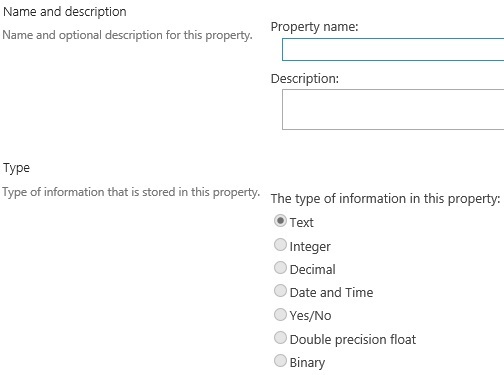 Enter the Property name and select the correct type. 7. Select the following options; Searchable, Queryble and Retrievable. 9. Click on OK to save the changes. 10. Preform a crawl to make the new refinement available. 11. Add the refinement option in the refinement panel.